This recipe uses a method of cooking fish known in French as à l’unilatérale — on one side only. The sea trout fillets are fried skin side down until their orange flesh has turned rosy. The balsamic cream adds a delicate, sophisticated taste. For best results, have your fishmonger fillet a very fresh medium to large sea trout, removing the bones but retaining the skin. One trout will serve two people. For the cream, chill both the whipping cream and the bowl in which you will whip it for at least 30 minutes before beginning. If you’d like to make cream rosettes, as shown in the photo, fit a pastry bag with a decorative nozzle. Rinse the trout fillets to remove any lingering scales and dry the fish thoroughly with paper towels. Set aside. Prepare the balsamic cream. Pour the chilled whipping cream into a chilled bowl and beat until quite firm. The cream should form peaks that do not fold over when you remove the beaters. Add the balsamic vinegar and fine salt and beat 30 seconds more. Refrigerate. Heat the oil to sizzling in a large skillet. Add the trout fillets, skin side down. Cook over medium heat for about 5 minutes, until the flesh is starting to turn from orange to pink around the edges — the amount of time will vary according to the thickness of the fillets. Every so often, gently insert a spatula under the trout to keep the skin from sticking. Now season the trout with the coarse salt. Cover the pan and continue to cook for another 5 minutes or so, until the trout is cooked through. Test by inserting a knife into the flesh. It should be entirely pink unless you like your trout very rare, as the French often do, in which case remove from heat while the center of the fish is still partially orange. 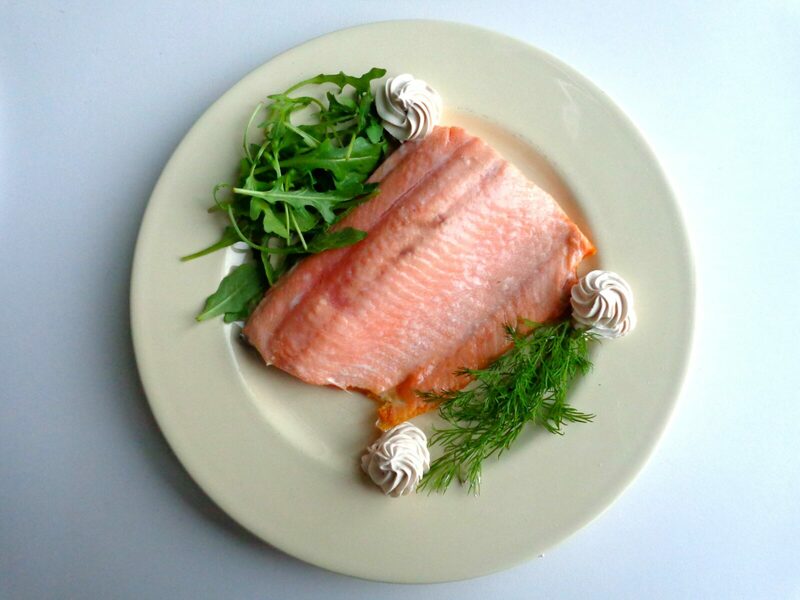 If you plan to make cream rosettes, as shown in the photo, spoon the balsamic cream into your pastry bag while the trout is cooking. When the trout is ready, place on plates, add some arugula or dill (or both) as a garnish, and decorate with the cream. If not making rosettes, simply place a spoonful of cream on each plate and bring the rest to the table in a small bowl. Add lemon quarters if you like, but be careful not to overwhelm the delicate cream. Serves 2.